Wildwoods complete line of Brazilian BBQ Skewer includes our beef rib Skewer. This is one of our most popular. Proper application: To barbecue whole beef ribs, leg of lamb, pork leg, Standing rib roast, bone in pork loin, and more. 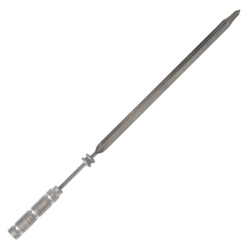 This is one of the many specialized skewers we offer. These Brazilian BBQ skewer are the same skewers used by professional restaurants. Now you can serve meats with style and flair with tableside carving just like at the Churrasqueiras in Brazil. We also offer the traditional serving boards, serving tongs and more. All our products are designed to enhance the BBQ experience.